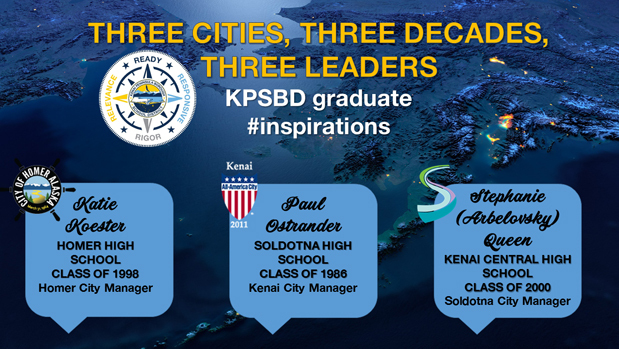 Meet Katie Koester [Homer High School Class of 1998] now Homer City Manager; Paul Ostrander [Soldotna High School Class of 1986] now Kenai City Manager; and Stephanie (Arbelovsky) Queen [Kenai Central High School Class of 2000] now Soldotna City Manager. To begin this series, Katie, Paul, and Stephanie talk about a favorite local spot during K-12 years, a city celebration, and vision, priority, or project that matters in their current work as city managers. Individual profiles for each of these graduates will follow in this four-part series highlighting KPBSD graduates. Katie, Paul, and Stephanie talk about a city celebration, favorite local spot, and vision, priority and project that matters. Individual profiles for each of these graduates will follow in this four-part series highlighting KPBSD graduates. Entrepreneurial spirit and partnerships "One of the things I really appreciate about Soldotna is how engaged our residents are. We've figured out how to work together across public, private, and non-profit lines, to move big projects forward. This has allowed us to accomplish several of the community's long-standing goals; something we would not have been able to do without strong partnerships. Downtown Connections: "Part of the City of Soldotna's economic development strategy over the past several years has been incremental investment in our downtown, and this is a priority I would like to continue to pursue into the future. We started with low-hanging fruitsuch as new highway banners, park signs, and landscaping improvements. And, we supported and encouraged events that bring people to Soldotna Creek Park and the commercial core.